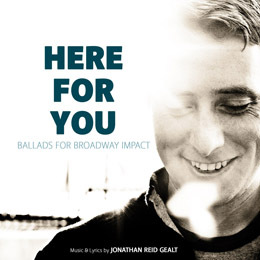 Young American composer Jonathan Reid Gealt, making quite a name for himself and best known for his ballad “Quiet”, is in London to launch his new album Here For You (Ballads for Broadway Impact) engaging an array of British talent at St James Studio . An opportunity arose to stage a teaser concert, TransAtlantic the night before the album launch together with British composers Craig Adams and Steven Luke Walker. Hence, this review covers both the performances. The shows are the result of a collaboration between two production companies ILIADebuts, which specialises in introducing live new international artists, and Theatre Bench, a company developing new theatre, dance and cabaret works. At one point during their preparations, organisers and creatives were communicating between three different continents, and with so many artists involved, particularly during the choral numbers, the small studio stage of St James was stretched to its absolute limit, adding to the general buzz of excitement. Gealt is an interesting composer to watch. 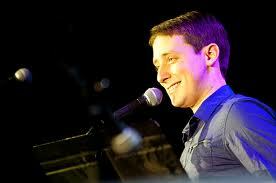 His music has a youthful sound with quite a country feel, especially when accompanied on guitar by MD Aaron Williams. His cannon is perhaps a little ballad heavy, but he avoids descending into simplistic boy band pop and sentimentality by employing complex rhythmic structures adding a tension that keeps the listener engaged. TransAtlantic opened and closed with a small selection of works by Gealt from the new album Here For You (Ballads for Broadway Impact). The many artists appearing that evening included Jennifer Tierney, Danielle Hope, Matthew Barrow, and Kelly Anne Gower. More about this work is discussed later, as it was repeated the following night along with other compositions of his. To perform “Quiet”, the organisers staged a competition on Twitter to see who would be invited to sing it. They were rather caught off-guard by the massive international response, but eventually narrowed the winners down to three performers, each of whom were given the opportunity to sing over the weekend. Hearing Tom Cromwell who flew from Australia to perform, it was really no surprise that he should have impressed. He sang with great sensitivity and control and made the song his own. Another finalist was student actor Daniel Gregory who sang “I Won’t Have to Anymore”, once again daring to put his own stamp on it. The third contender, Jess Barker, was the most surprising in that she is a former psychology student, just about to embark on her 1st year at the Guildford School of Acting – so not even trained yet. Her performance of “Quiet” on the Sunday evening broke the song into distinct sections to tell the narrative within it, and was mesmerising. Steven Luke Walker presented a number of songs from musicals he has already written, including The Boy King and The Lion, The Witch And The Wardrobe, featuring about 10 artists including Kerry Ellis, Elissa Clare Morgan, Anna McGarahan and the GSA choir. Much of Walker’s work is sparked by stories and films, and I was particularly struck by Alice Fearn’s skilled story-telling in “Suddenly”, based on The Princess Diaries. The song of the night, though, was “Up There”, inspired by the film Brokeback Mountain and performed by Norman Bowman, Fra Fee, Alice Fearn and Summer Strallen. This is a very mature work featuring stirring waves of music with characters well differentiated, not least by the individual interpretations of the singers. Craig Adams, Composer in Residence at the Finborough Theatre and perhaps best known for his musical Lift, also enjoys adapting stories and plays for music, and his section included “Tenders of His Affection” from Battlements, inspired by Hamlet and sung with heartfelt passion by Ellie Kirk, and songs from Soul Music, an adaptation of a Terry Pratchett novel. His most arresting number was “Jane’s Lament”, excellently performed by Jane Tierney, from ShadowThief, a new dance piece based on Andrew Matthew’s children’s story “Bob Robber and Dancing Jane”. The evening was the song’s public debut and the piece sounds very promising. Back to Gealt. The Sunday performance of songs from Here For You (Ballads for Broadway Impact) also included material from previous album Thirteen Stories Down, and pieces from a new show currently in progress, Dust and Shadow. This was because Gealt wisely chose to avoid staging a whole show of ballads, and it also gave him an opportunity to air some of this very new material for the first time. Despite the success of “Quiet” and it being so many fans’ favourite, Gealt’s own favourite of his works is the soul number “Home Away From Home”. On Sunday, this was sung by the stupendous Gloria Onitiri, sending shivers down my spine. However, my favourite from this album is the touching “No Reason At All”, to which Craig Colton treated us an affecting and heartfelt interpretation, where the strength of his voice stemmed from real emotion. The material from Dust and Shadow heralds a change of direction from this gifted writer. This new musical set in 18th century London is based on a novel of the same title by Lyndsay Faye merging the stories, real and mythical, of true life character Jack the Ripper and Arthur Conan-Doyle’s creation Sherlock Homes. The style is very different for Gealt with hints of classical elements. “What Are my Orders?” (Scott Garnham) and especially the chilling “Jack’s Letter” sung by Matthew Barrow are quite Sondheim-esque in their brooding qualities and strong characterisation. I very much look forward to seeing the completed work. Superbly accompanied by Tim Evans and occasionally Gealt on piano, Aaron Williams and Alex Connolly – Read on guitar and Dominik Todd on bass, the two evenings have proven a triumph for composers featured. Gealt left the stage on Sunday to a much deserved standing ovation. I am intrigued to see where this next generation of musical theatre composers go, not only in terms of subject matter, but stylistically and vocally. What we saw over this weekend was a great testament the talents of Gealt and the British writers, and the many singers featured. Personally, I would welcome a return to writing for a variety of vocal tone, including classical voice, and not just for the ubiquitous twang/belt quality that has been so popular since the ‘80’s. Walker has written an acclaimed adaptation of Little Women using ‘legit’ quality and we might see it in Gealt’s Dust and Shadow. I would encourage more composers to embrace different vocal styles. It would greatly enhance characterisation, and add weight to the sound and performances available on West End stages. London is experiencing a real renaissance in musical theatre and cabaret right now, and it is an exciting time to be here. Gealt’s talent is a welcome addition. This entry was posted in Cabaret Reviews and tagged cabaret, cabaret reviews London, Craig Adams, fiona jane weston, ILIADebuts, Jonathan Reid-Gealt, London cabaret, St james Studio, St james Theatre, Steven Luke Walker, Theatre Bench. Bookmark the permalink. 1 Response to TransAtlantic: Jonathan Reid Gealt, Craig Adams and Steven Luke Walker And Here For You: Jonathan Reid Gealt in Concert.